I had the pleasure of presenting the amazing work of Debbie Miller, Todd Whitaker, and Angela Maiers among others for a meeting of the Northwest Iowa Reading Council this afternoon. My job was easy–just sing the praises of two great educators. Here are the slides from my presentation. A couple of years ago I wrote a poem for my students called “My Wish for You”. It ended up as a “guest post” for my colleague, mentor, and friend Angela Maiers. The past couple of years I’ve asked my kids to write a “We Wish” poem in response to what I wrote. Well, THIS YEAR, after a slow start with early outs due to extreme heat, we finally got our class poems done and videos made this week. Here they are. I think the kids did a GREAT job on them. The words truly are their words, mostly serious and honest, but some reflect their 10-11 year old silliness. What a privilege to be called “teacher” by these kiddos. I truly have the best job in the world! Please consider leaving us a comment and let us know what you think of our poems and videos. A little common sense: Don’t post complaints or sarcastic remarks on Facebook or any other social media sites. First of all, as you can see here, it can get you fired. Secondly, nobody really wants to hear you complain in person, let alone publicly on the Internet. Thirdly, please LEARN how to adjust your security and privacy settings. It’s really just common sense! 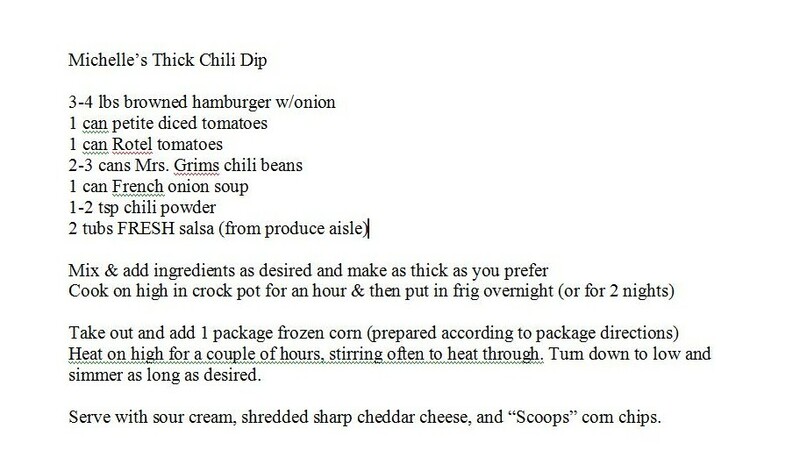 I attempted to make this “chili dip” last week for our school staff. Whenever I make chili, I just dump in a little of this, a little of that and keep tweaking until it suits me. For this, I wanted it to be more of a “dip” and less of a “soup”, so I was going for super THICK. Unfortunately, I’m not real good at writing down things when I’m getting creative in the kitchen (which isn’t that often!). SO, here’s what I THINK I put in and pretty much how I made it, mixing and simmering one evening when I had time, letting it sit in the frig for a couple of nights, and then heating it back up when I needed it. Served it with some sour cream, shredded sharp cheddar cheese, and some “Scoops” corn chips and it was a hit.